Try This Kissing Technique In Rubber Stamping To Achieve Interesting Patterning On Your Plain Rubber Stamps. The Kissing Technique in rubber stamping is so much fun, and so very versatile. We were reminded about this technique in our monthly "Impressions", the very informative newsletter all demonstrators receive from Stampin' Up! Having tried this when I first signed up to be a demonstrator, (I think I tried everything once!) I was inspired to give it another go. I have a much more extensive stamp collection now, and found that while I went to my "safe" and much loved floral images to make this sample card, I am looking to use some children's sets such as "By Land". This set can be found on page 63 of the Stampin' Up! Idea Book and Catalogue. While you are there, flip through the pages to identify other sets that would work well for this technique and put them on your Wish List. Wish Lists are very useful and help you work out just which rubber stamp set, papers and accessories you just HAVE to get first. You can always contact me via this site to order your Stampin' Up! products - you can place an Individual Order, or you can do a Catalogue Workshop where you gather orders from a few friends. Hostess Benefits apply when the product order reaches $300.00. Postage and Handling is an additional 5% of the order total or $5.95 whichever is more. Now you may be wondering what this Kissing Technique is all about. You find a bold stamp that you like. 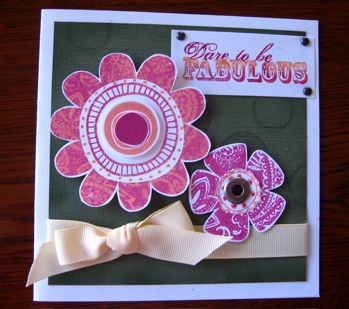 For this example I used "Bold Blooms" from Stampin' Up! and the lovely "Paisley Background" stamp. Ink up both of the stamps - using a different colour for each stamp. One colour should be lighter than the other. I have used Groovy Guava and Purely Pomegranate from the 2008 - 09 In Colour range. I used the lighter colour to ink up the image that I wanted to stamp, and the darker colour on the background stamp. Once the 2 stamps are inked you use the Kissing Technique which means you place the smaller stamp onto the background stamp and it takes up that image. 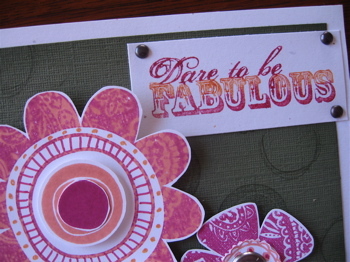 You then stamp onto your cardstock. I also used my Stampin Write Markers for extra details, dimensionals to achieve some height in the design, jumbo eyelts, brads, cropodile, textured card stock, Confetti White card stock and the very versatile 1.6 cm Grosgrain Ribbon. The detail shot shows just how interesting the patterns can be. You have some control over the section of pattern you use for the Kissing Technique, and your imagination is the only limit to the variations you achieve. If you would like to learn more about this technique you can contact me via this form and I will reply to your question. Return from Kissing Technique to Stamping Techniques and you can navigate to see other techniques that you are sure to find interesting.